After reading What Happened, I gained a far better understanding of Hillary Clinton . 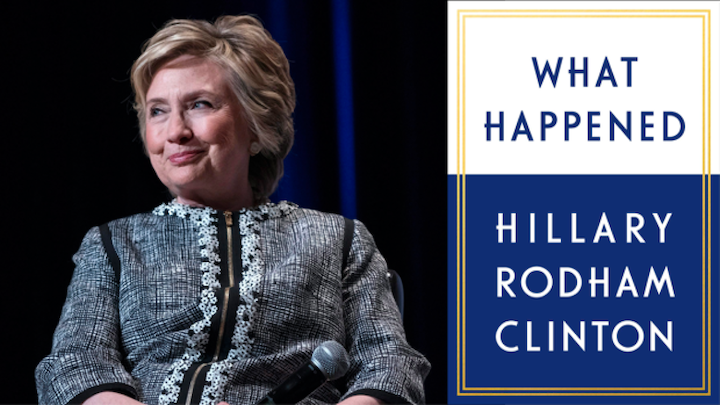 What Happened, Clinton’s latest book release, details her account of the events surrounding her monumental upset in the 2016 Presidential Election. There are some striking differences between the Hillary Clinton presented in the book versus the way she presents herself in public. She’s still sharp, detail-oriented, and composed as ever, but there’s a sassier side to her that generally doesn’t show up in the public eye. She’ll never skip a breath to remind the reader that she won the popular vote, throw a targeted jab at a political opponent, or that you should sleep with socks on to prevent your feet from getting cold. Within the same sentence where she suggests Paul Manafort is in league with Moscow, she slyly mentions that the Green Party’s Jill Stein attended the same meeting. She reminds me of my loving grandma who talks trash while continually beating me in every round of a card game. President Obama probably also felt the same way when he advised her “Don’t try to be hip, you’re a grandma”. I reckon Mrs. Clinton and I would make good friends: we both have a deep penchant for political discussion, love looking at specific details of policies, reading books, and we both care about the country and the people in it. Throughout the book, Clinton often wonders why she and her team failed to present this “friendly”, “trustworthy” version of her true self. Although she blames herself and takes personal responsibility for her campaign’s mistakes throughout the book, those apologies are truly tongue in cheek. Her book is dedicated to Clinton painting herself as a victim to events beyond her control and pointing a finger to anyone who may have affected the election. Her perfectionism is very admirable, but it also renders her plentiful anecdotes feel more like a precisely placed narrative rather than a touching heartfelt story. Maybe this is her version of being “honest” or “in the open”, but the inconsistency of this attitude permeates through “What happened”. I wanted to like it, but the story is so perfect that it feels like PR or as if I’m watching an advertisement. The book is littered with anecdotes like these – sometimes they succeed. I chuckled at how she urged Bill to wear a trench coat to Trump’s rainy inauguration, or at how she heard the ponchos given out were originally white, until the inaugural organization realized that they’d look like KKK hoods at certain angles. I felt the same knot in my stomach when she didn’t have the appetite for a glass of orange juice on the morning November 9th. However, they usually they feel out of place. At the beginning of the chapter “Getting Started”, she spends a page describing a stop at a Chipotle from one of her campaign vehicles called “Scooby”, named because reminded her of the Mystery Machine without the “psychedelic charm”. Maybe some readers will enjoy that she has something to say about eating a “chicken burrito bowl with a side of guacamole” while travelling cross-country in a generic, oversized, black van. But throughout her 500+ page book, her attempts at portraying a “relatable” persona begin to feel tiring. And that’s because the substance of the book is still in the politics. Anyone who has an interest in reading this book has an interest in what was happening inside the Clinton camp during the 2016 upset. Everything else is fluff. During the campaign and election accounts in What Happened, Clinton delivers strongest on her analysis of “what happened”. During these moments, the sweet, sensitive Grandma transforms into a fierce, determined politician. The list is extensive, but not limited to, Fox News, MSNBC, Bernie Sanders, the FBI, misogyny, racists, Russia, the New York Times, third party candidates, and even campaign donation laws (Even though she outspent her opponent by 200 million). She spends ample time detailing her campaign strategy, evaluating why certain tactics were chosen and why others weren’t. She describes how she hired and structured her the campaign team. She explains her platform and her pitch for how she would have made a good president. She’s insightful about the strategic successes and failures. She apologies for damning mistakes made through the campaign, such as the moment she proclaimed that her policies were going to take coal miners out of business. She also defends her more controversial statements, standing by and giving a reasoning for calling half the nation “deplorable”. Once that’s all out of the way, she points blame at people and organizations who hurt her shot at becoming the President. The list is extensive, but not limited to, Fox News, MSNBC, Bernie Sanders, the FBI, misogyny, racists, Russia, the New York Times, third party candidates, and even campaign donation laws (Even though she outspent her opponent by 200 million). She blames Bernie Sanders for forcing her to take a more moderate platform and driving away potential voters. Within the same page, she thanks the New York Times for their glowing endorsement, yet finds their coverage of her unfair. Her charges against journalists felt out of place, given that the majority of mainstream press was overwhelmingly negative against Trump. She feels like the media didn’t do enough to highlight the positive aspects of her campaign while Trump’s coverage was focused on actual issues. If you’re already with her, you’ll find plenty of great campaign stories and strong arguments for her qualifications to be POTUS. If you’re not, there’s quite bit of attack fodder in here for you to use. Undoubtedly, there are partial truths to all of her claims. Misogyny and racism are still ingrained in our society. Perhaps the FBI acted unprofessionally far too close to election day. Of course, a foreign adversary would try to use propaganda against U.S citizens in order to influence an election. Insurgents always try to sway the base in the primaries. It’s as if she’s blaming general truths and suggesting if only it was a perfect, compliant world, she would have been victorious. Hillary Clinton has defined her career as a fighter and as a polarizing figure, so the former lawyer is smarter than to expect that. Not once does she attack her staff, her campaign managers — such as John Podesta —, allies, or the DNC. So, if anyone hopes to hear some juicy insight regarding rumored campaign dysfunction, they won’t find it here. It’s clear that the targets are all political.There’s a moment where she gets a chance to correct the record about the content of her paid, private speeches, but here’s where she respects other organization’s “unique experiences of behind the scenes accounts” and takes the blame herself for wanting to “earn a very good living” and meet interesting people. Though I don’t blame her for wanting to make a quick buck, the maneuver shows that she’s shielding allies by not telling the whole story. As smart and sharp as she represents herself in this book, it’s jarring to see her play into these overtly political games that she clearly doesn’t believe. That inconsistency disappointed me as a reader. Where I wanted What Happened to be an introspection, it actually just clashed with more political banter. Regardless, What Happened is an interesting read which offers insight into the experience of running for president in such a tumultuous time in American politics. If you’re already with her, you’ll find plenty of great campaign stories and strong arguments for her qualifications to be POTUS. If you’re not, there’s quite bit of attack fodder in here for you to use. Her quote selection is phenomenal, and I’ve already saved quite a few for future use. There’s something for everyone if you’re willing to put the time into reading it. What happened should be retitled……………………It’s not my fault. She ran on a third Obama presidency……………………..that’s what happened. Apparently common sense isn’t taught in college anymore?